*Note: This artical is going to be edited into a bigger article in the near future. James Henry Carleton was born at Lubec , Maine , on December 27, 1814 . He was the son of John and Abigail (Phelps) Carleton. His father John was a ship captain. At age twenty-five he was commissioned a lieutenant in the Maine militia in 1838 and participated in the boundary dispute with Canada known as the "Aristook War." He received appointment as a second lieutenant in the First Dragoons on October 18, 1839 , and then trained at Carlisle Barracks. In October 1840 he married Henrietta Tracy Loring of Boston . Henrietta accompanied Carleton to his duty assignment at Fort Gibson , Indian Territory , where she died in October 1841. Later in the 1840s Carleton served as assistant commissary of subsistence at Fort Leavenworth , accompanied Maj. Clifton Wharton's expedition to the Pawnee Villages in Nebraska , served as an officer on Col. Stephen Watts Kearny's 1845 expedition to South Pass , and saw action in 1847 in the battle of Buena Vista . In 1848 Carleton married Sophia Garland Wolfe, niece of Gen. John Garland. During the 1850s Carleton served under Garland in New Mexico Territory . Summer of 1858 saw him, his family and 700 raw recruits stationed at Fort Tejon , California as commander of the Fort with the First Dragoons. In 1859 he was ordered to Salt Lake City to investigate the massacre at Mountain Meadows in 1857 of 120 Arkansas emigrants. He concluded that it was Mormons dressed as Indians and 20 years later a court convicted one and he was executed at the spot of the crime. At the outbreak of the Civil War, Carleton was appointed to Colonel of 1st Infantry, California Volunteers on 26 July 1861 by then Governor John L. Downey. 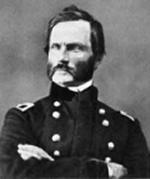 He would ultimately become brigadier general of the California volunteers and command the "California Column" on its march to the Rio Grande . non-battle causes. The hike from Wilmington , CA to El Paso , TX has been reported to be the longest infantry march in US Infantry history. Carleton was basically in command in Southern California from January of 1861 to April of 1861. In September 1862 he replaced Gen. Edward R. S. Canby as commander of the Department of New Mexico. One of Carleton's first acts upon assuming command was to reissue Canby's order establishing martial law in New Mexico . He also devised a passport system to distinguish loyal citizens from Confederate spies. Although Carleton never attempted to set himself up as a military governor, he believed he had authority to carry through any policy he deemed essential to the peace and prosperity of the territory. Many of his actions antagonized the citizens. In addition to securing the territory against Confederate intrigue, Carleton took steps to subdue hostile Indian tribes. He sent Col. Kit (Christopher) Carson and other subordinates against the Mescalero Apaches with orders to kill all Indian men "whenever and wherever you can find them." By February 1863 the Mescaleros had been relocated on the new Indian reservation of Bosque Redondo on the Pecos River . Carleton then waged war against the Navajos, ordering Carson and other officers to destroy all crops in Navajo country to starve them into submission. Carleton's strategy brought immediate results. Some 8,000 Navajos surrendered and then made the "Long Walk" to Bosque Redondo, where Carleton planned to turn them into Christian farmers. The Bosque Redondo experiment ended in failure, however. The Mescaleros quietly fled the reservation, and the Navajo captives faced death, disease, and a constant shortage of food. The cost of maintaining Bosque Redondo persuaded the government to allow the Navajos to return to their homeland. Carleton's policies became ensnarled in territorial politics. Although his superiors believed him an efficient and capable officer, hostile criticism led to his reassignment early in 1867. After a long overdue furlough he returned to duty in 1868 with his regiment, the Fourth United States Cavalry in Texas . He served with his regiment until summer of 1872. He was granted six months medical leave in a "cold climate" for chronic excema problems with his legs. He returned to duty in December of 1872 probably by ship. He was hospitalized with bronchitis contracted enroute. He never fully recovered and left New Orleans for San Antonio in the cold rainy season. After arriving on December 28th he contracted pneumonia the next day. He was hospitalized the next day and died in San Antonio on January 7, 1873 . Carleton and his second wife, Sophia, had five children; two died in childhood. Carleton published several accounts of his military experiences. His oldest son, Henry Guy Carleton, became a journalist, playwright, and inventor.